Citation: Talus. "The Customs of a Coca Connoisseur." Erowid Extracts. May 2015;27:20-21. Coca leaf powder is my favorite stimulant; I've been using it for about five years. It's quite easy to order online from Peru. By pre-mixing the powder with baking soda and slipping a spoonful between my cheek and gum, I have a modern version of the traditional coca leaf quid used in many parts of the Andes. Benefits of this method are its easily titrated short duration (I can remove the quid an hour before bedtime and be able to sleep) and its smooth, energizing effect. I use coca to reduce fatigue, boost energy while backpacking and combat altitude sickness while mountaineering, as well as to reduce hangovers and enhance studying. It has always astonished me that it is so easy to order. I've also been puzzled that more of my friends don't use coca powder, or that they aren't aware of its availability and utility. I have primarily purchased the powdered leaf from a vendor that bills it as 'Inca Tea'. I have consumed about 500 grams a year and have not encountered any difficulties with supply. That came to an end about a year ago. With one order, there was a note from the vendor boasting that they had a new option to ship orders using DHL. Previously, the only option had been EMS, a trusty but much slower and less accounted-for international shipper. Delighted to be able to make use of more modern systems, I chose to pay an extra fee for DHL service, thinking I could expect faster shipping and track my package with fewer hassles. I should have known better. The package's tracking status progressed from port to port until it was held up at US Customs in Miami, a fact I learned once I contacted the seller, who had greater access to data about the delay. The seller agreed to send a second package free of charge using EMS. Despite being shipped to the same name and address that was on the original DHL package, the EMS parcel arrived without issue. Several months later, having forgotten about the incident, I found myself in line to clear Customs in Dallas, Texas during a return flight from a vacation in Mexico. The officer reviewing my electronic receipt from the kiosk I'd lackadaisically checked in to at Immigrations flagged me to have my luggage dumped and searched. My partner and I were in danger of missing our connecting flight, but we decided it would be better if we stuck together. I was pretty freaked out--I carry a small assortment of unlabeled pills and medications wherever I go, some of which are controlled--and after a carefree week of relaxation I was struggling to contain my distaste for the plodding inelegance of 'the system'. While waiting in line, we observed a young man with blonde dreadlocks who had been just a few folks ahead of us getting escorted into a separate room, only to emerge later in handcuffs with a dejected look on his face. It was hard not to feel contempt for these agents of control. My partner reminded me to stay calm and respectful. When we were finally summoned forward, the official ordered us to bring our luggage to the long stainless steel table where he scattered our belongings. I didn't expect to feel so violated. The search kicked off when I was greeted with 'Hello Mr. Lastname, you wouldn't be bringing any more coca into the country, would you?' (My spouse was horrified when she heard this.) It hadn't really occurred to me that a package stopped at a shipping facility might be linked to a Customs search when returning to my country. The officer proceeded to rummage through our belongings in a deliberate, relaxed manner, starting with my wife's bag. 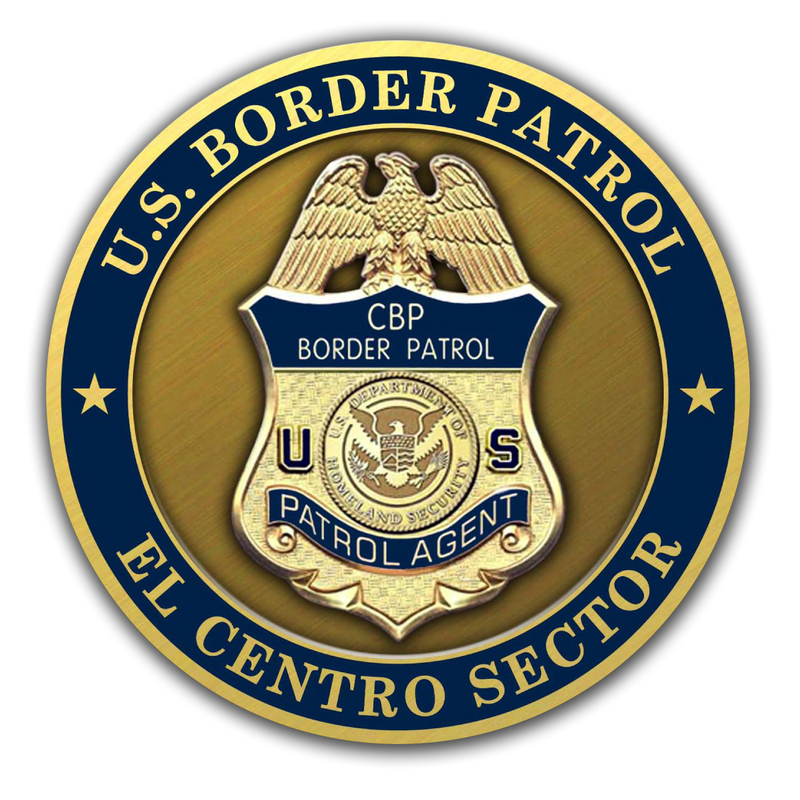 He explained without looking up that we had landed at a bad time to go through Customs, as we were arriving during a shift change when fewer agents were available and some were occupied with the young man's arrest, causing a delay in searches. As he picked through packed souvenirs, presents, and my wife's underwear, he casually asked us pointed questions requiring precise, prompt answers. Most unsettlingly, he would pause to examine the quality of our eye contact and facial expressions. It was clear he was well practiced in focusing a suspicious eye on people to assess threats and dissimulation. Moreover, he seemed to be trying to determine whether we were the type to oppose authority or creatively relate to the law. Having my wife by my side was advantageous: with her I passed more easily as a settled 'family man', another stable, tax-paying and law-abiding, harmless cog. Soon, the official switched to a much more personable self-presentation. I thought he was trying to disarm me into saying something incriminating, but in the end, I think he was breaking character and allowing us to see him as an ordinary guy doing his job. He delivered a mini-lecture on not ordering coca tea online, because of, you know, its association with its naughty cousin. We dutifully nodded and acted dumb and grateful for the tip. In a fascinating turn, as he examined my wife's carefully labeled baggies of over-the-counter and prescribed medication (my wife peels her prescription labels off and sticks them on little bags in the interest of space-saving), he helpfully recommended that we always travel with actual prescription bottles in order to avoid hassles if we should undergo a future search. He also explained that even though we'd bought our bottles of tequila in duty free in Mexico, we would not be allowed to keep them in our carry-ons! We hastily repacked our bags right there at the search table. (Thanks, Customs Guy!) After deciding that we were 'good people', and chatting about the housing markets of his hometown and ours, he said we could repack my wife's bag and move on--without even searching my bag! We managed to make our flight, but we were shaken. It was a reminder of how so many elements of my lifestyle that I take for granted as self-evident human rights are conceived of as being illegal; a threat to the common good. Especially disturbing is that coca, a sacred plant central to Andean culture for thousands of years, was taken out of its native context by this same western society, concentrated into powder cocaine, and vilified by inextricably linking it with criminality and violence. Perhaps the most practical lesson: I got pulled out of a line of hundreds of passengers because a product I ordered through the mail had been confiscated by Customs a year earlier. I'm so ready for more intelligent, or at least less stupid, public policy. The wad of coca leaf for chewing is known as an acullico in the Andes, from the Quechua akhulliku. Making and using a coca quid for buccal administration is easy. 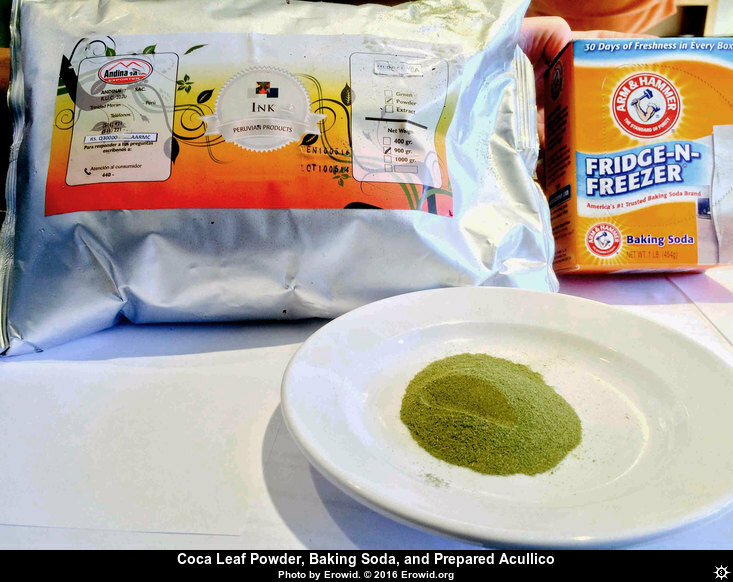 My method uses powdered coca leaf and my local source of alkalizing admixture: baking soda. Put one cup of coca powder and one teaspoon of baking soda in a jar. Screw on lid and shake. When the fine dust settles, slide a small teaspoonful (about two grams) between cheek and gum. Compact with the fingers against the outside cheek to form a quid. Leave it there or turn with the tongue; it will moisten with saliva. The more baking soda I add, the stronger the effects are, but also the more saliva that is produced, meaning the quid turns runny and dissolves more quickly. It is fine to swallow the liquid; I always do. If the quid is too dry, or if I don't notice subtle effects in the first 15 minutes, I add more baking soda to my source jar. It should have a salty taste but not be so strong that it irritates the gums. A good quid can last between 30 and 90 minutes before it disappears. The effects quickly dissipate and I am fully back to baseline in 45 minutes. The effect of coca is cumulative; if I use the right ratio and properly manage quids throughout the day the effects build and approximate the plateau of a moderate dose of insufflated cocaine, only with less euphoria and more focus. Because of the slow onset, there is no rush or crash. Compared to caffeine, I experience much less 'body load'. I don't get jitters, irritability, or an acid stomach (though, as with coffee, there can be a laxative effect). Coca is fine on an empty stomach (it actually helps me when I am hungry and on the trail), and because of its shorter duration, I can use it in the evening and still expect a good night's sleep. I haven't noticed tolerance, hangover, or any kind of withdrawal symptoms when I go without. I'm uncertain about the effects of the baking soda on my system, but I do know coca is nutritious and gives me an incredible edge over my mountaineering group when climbing, especially at altitude. v1.01 - Jan 2016 - Erowid - Published on Erowid.org. v1.1 - Feb 2016 - Erowid - Added images and changed to article format.